The KMA Group heritage dates back over 140 years, originating in the Netherlands as a sail-making and leather working business. From there it has grown from strength to strength within several sectors including, but not limited to, Defense, Medical, Aviation and Personal Protection Equipment (PPE). In 2008 KMA Textiles Ltd, establised by Phil Melling, joined the KMA group of companies with its own unique positioning within its niche markets in the UK, Ireland and North America. In 2013 the company became accredited to ISO9001:2008, UKAS approved, allowing it to tender for government contracts. KMA Group is well established in a number of industrial and commercial sectors. This spread of sectors is facilitated by the combination of our design skill and our knowledge and manufacturing capability in using the best and latest materials. KMA Group has a long history (over 100 years) as a supplier to defence, police and other law enforcement organisations where quality and reliability is of the utmost importance. The services provided include technical advice, validation and testing. From prototyping to series production, KMA is able to realize the top quality products required in this line of work. 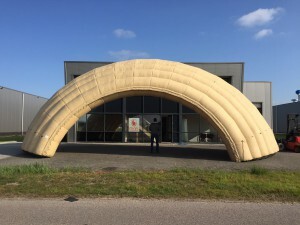 Air Shelter: For Dutch MOD KMA has worked on one of the largest air shelters available. 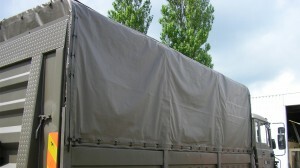 Truck Cover: This heavy duty truck cover is made in Heerenveen. KMA's machine park includes HF welding machines for attaching large areas of PVC fabric. Light Weight Shelter: This shelter is made from durable lightweight IRR material and offers maximum protection agains the elements. Easy to transport and very quick to erect. Safety and reliability are key factors in the aviation industry. KMA Group havs the experience, the know-how and the technology to produce all textile related products for the aviation industry. For Unit Load Devices (ULD) the company manufactures covers, webbings, cargo nets and straps for all types of containers. Next to producing standardised articles they are able to manufacture made to order products according to customers' specifications, colours and materials. KMA also manufactures various types of products for use inside the cabin such as onboard tool kits and navigator bags. KMA Group has been a supplier to the aviation industry for over 30 years. From prototyping to series production, KMA is able to realize the top quality products required in this line of work. 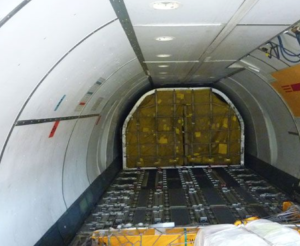 ULD Covers & Nets: Safely securing cargo is of the utmost importance. KMA has the experience and know-how to quickly and efficiently manufacture the best cargo nets and covers for all types of ULDs, standard and bespoke. Navigator Bag: A true classic. The KMA navigator bag is a classic for pilots all around the world. 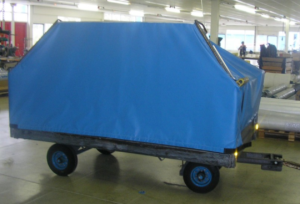 Bagage Cart Cover: This heavy duty bagage cart cover is made in Heerenveen and is used on airports all around the world. KMA's machine park includes HF welding machines for attaching large areas of PVC fabric. Technical Advice – IRR (infra-red reflection), anti-flash, anti-static, thermal insulation and ballistic protection. Inspection and possible repair of flak jackets. Validation and Testing – KMA has extensive experience in testing and supervising the testing of technical textiles. Prototyping & Production by their own prototyping department is a product quickly and easily traceable process. The move to production dovetails perfectly. Safety and reliability are key factors in the aviation industry. KMA Textiles has the experience, the know-how and the technology to produce all textile related products for the aviation industry. For Unit Load Devices (ULD) the company manufactures covers, webbings, cargo nets and straps for all types of containers. Next to producing standardised articles KMA Textiles is able to manufacture made to order products according to customers' specifications, colours and materials. KMA also manufactures various types of textile products for use inside the cabin such as onboard tool kits and navigator bags. KMA textiles and the maritime industry have a long history together. The specific requirements for marine & offshore industry often require customized solutions where safety and quality are of paramount importance. KMA textiles has shown in the past to be an ideal partner in this. This has led in the past to several products from sailing screens to duffel bags. KMA Textiles specializes in customized solutions for tents, shelters, awnings, roof covers. 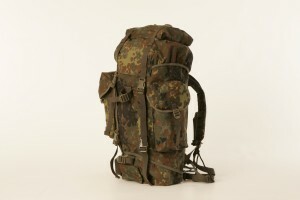 and accessories such as holdalls. their extensive HF welding line enables them to handle all types of textile cloth to very large areas. Doing so the company can work together with the client to create a tent made to the desired requirements. In addition to production and development KMA textiles also performes inspection and necessary repairs of USAR shelters. In the health care industry and medical solutions the quality, finishing, and the choice of materials is of great importance. KMA textiles is proud to offer a wide range of products produced for this sector. These products range from mattress covers in various materials, lifting aids, bags for transport of organs and many more. KMA textiles has built up a good reputation when it comes to rolling container cart covers. 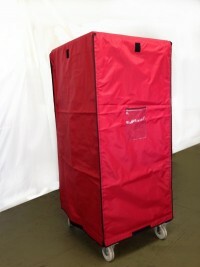 Due to developing and producing various models KMA Textiles has developed a wide range of container cart covers. 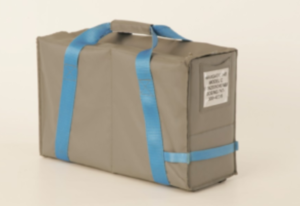 The assortment ranges from a simple cover for temporary protection during transport till fire-resistant sleeves for use in distribution centers. KMA textiles can produce these cases quickly and according to your wishes. Colors, logos, document holders and other matters can be included into the design. Production takes place after agreement on the pre-production model so customers always know what to expect. Within KMA Textiles Safety, with special attention to fire safety, plays a big role. By working together with the Dutch company Fabrics Fire, KMA textiles are in a leading position when it comes to fire protection products. KMA Textiles has the ability to produce transport solutions with unique fire safety capabilties. Specialist knowledge in the field of non-combustible material and extensive knowledge of textile have led to a unique product. These products can be used widely ranging from aviation to football stadiums.